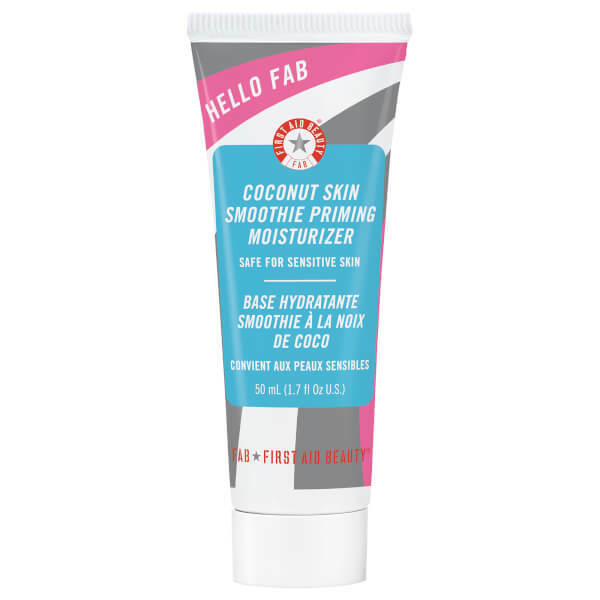 Improve the appearance of your skin with the First Aid Beauty Coconut Skin Smoothie Priming Moisturizer, a 2-in-1 skin hydrator that intensely moisturises skin whilst perfecting the look of pores and blemishes. Combining the benefits of makeup and skincare, the oil-free moisturiser intensely nourishes whilst brightening and smoothing skin. Its host of protein-rich superfoods, including Quinoa and Coconut Water, repair, fortify and revitalise, and light-reflecting micro-pearls inspire a dewy glow. Rich in minerals, it will visibly blur the appearance of pores and imperfections for smoother-looking skin, and its priming properties lock makeup in place for long-lasting wear. Skin is quenched, radiant and perfected. Can be worn alone or beneath makeup. Apply evenly over clean face. Follow with makeup or wear alone for a natural look.